It'll seat two figs; pilot on the left and co-pilot / ballast on the right. It's more comfortable than it looks, perhaps. Ready to really irritate any prospective invaders, with it's pulse laser whatjamacallit on the front. The landing gear (who said legs ?!) is fixed in position using the magic of Technic.. 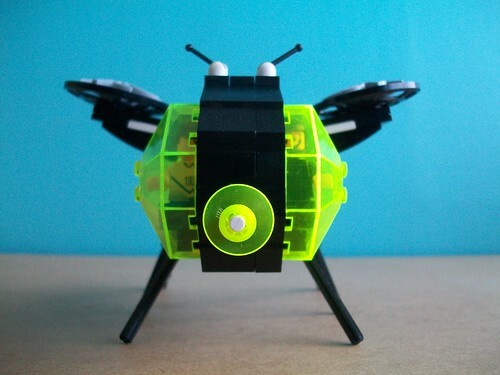 Reminds me of the late 90's early 00's insect sets, Pretty cool idea for the cockpit. Somthing about this creation really BUGS me! ha ha ha! I love the eyes/canopies. Reminds me of the old Bell. Cool landing gear too. Does it make that same irritating "bzzzzz" noise awakening you at mid-night?... Honey! Where is my electric flyswatter?!? Anyway, that an original entry for DA 2. And a great way to beat pig-copter. Oink vs Bzzz!! Ha ha!! 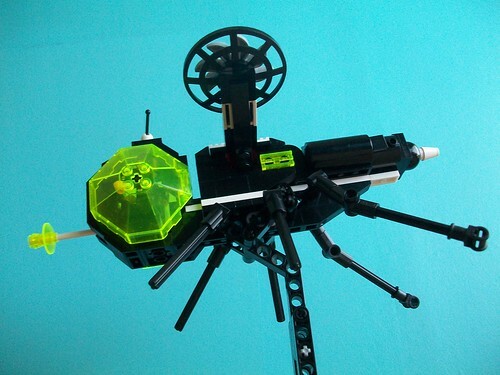 A great work of Lego "Ant" creationism! Very cool looking. I've always liked how Blacktron looks. Good luck in the coming combat! Very nice look - you can't go wrong with Blacktron II - and I really like the way you've adapted the classic cockpit design. Also, 3-wide fuselage? You like making life more difficult for yourself, I approve! Great concept and brilliant build. More like war wasp! I like the neon green aspects. Another interesting take on the category, but stay away from General Robert's fly-swatter! General, you are specifications-accurate and ready to rule the unfriendly skies of DA2. Good luck! Cool Ant Nick! Smells like Blacktron II! The Northern Imperial AKA - Lord Bacca. Invading with Blacktron? Or did that ant get into some nuclear waste? A super insectoid shape, though even Llwyngwril Systems' crazier designs do have proper seats. Still, the pilots will have nice, tight buttocks from clenching them to stay in the cockpit! It would deserve 5 stars just for "the old telephone". Plus, it looks awesome ! Laser whatjamacallit? What about the spray tanks for spreading biological toxins over enemy territory? Malaria, anyone? I may be confusing with mosquitoes, but what's one pesky critter or another, between friends? Ant gone mosquito incognito? aiaiai. Spanish. That's nice my friend. Very well thought out and built model. Impressive. Good idea. Great execution. That front is really classic, and the tiny rotors make it look really cute.